We design and implement projects for multilaterals and governments. We partner with different types of organisations to further financial inclusion. 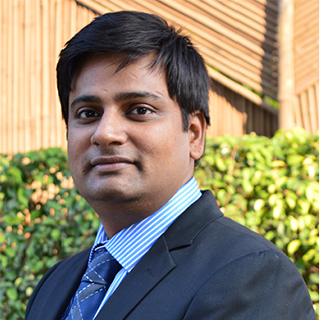 Anurodh Giri is an expert on Research for financial inclusion. With seven years of experience, he is focussed on market research, strategy/business planning, project management, product development, risk management and internal controls, and digital financial services. He has experience working with MFIs, Bank, FMCG and Donors in development sector in India, Indonesia, Sri Lanka and the Philippines. Value Chain Assessment and Mapping of Maize and Batik in Indonesia, funded by OIA, 2013: Desk research to review existing literature on value chain financing landscape and digital financial services in Indonesia; preparing analytical framework to assess potential value chains. Savings Product and Process Development for Nirantara Co-operative in India, funded by OIA, 2012: Secondary research to understand the prevailing market dynamics; analysis of collected data to suggest suitable savings product such as Pigmy deposit-a daily deposit scheme (PD) and recurring deposit (RD). Consumer Research on Client Protection in India, funded by Omidiyar Network, 2012: Developing market research plan; customising ServQual tool to client protection principles (MicroSave proprietary tool); conducting market research to administer customised SerQual tool on clients; analysing the collected information; and presenting the findings in report. Mobile Banking Scoping Study in the Philippines, funded by OIA, 2012: Designing a market research project to understand the potential of savings and remittance among the APPEND clients and assessing clients’ transaction behaviour around savings and remittance. Market Research on Mobile Banking Agent’s Operations in India, funded by Bill & Melinda Gates Foundation, 2011: Developing the market research plan; co-ordinating with the partner institution to set up the research schedule; recording financial transactions of agents; analysing the data collected and reporting the findings; and managing the project implementation and client relationship management. Market Research to Understand Dormancy in No Frills Accounts (NFAs) in India, funded by Omidiyar Network, 2010: Conducting group discussion with NFA clients, recording daily observations and findings and preparing research reports. Feasibility Research for Business Correspondent Service in India, funded by Omidiyar Network, 2010: Designing a market research project for identifying whether rural clients valued the BC services. Optimising Agent Networks for E/M-Banking in India, funded by Omidiyar Network, 2010: Designing a market research project to understand the clients’ rationale while selecting a mobile banking agent. Market Research for Assessing Remittances Networks in India, funded by Omidiyar Network, 2010: Understanding how migrant workers currently send money home; the risks involved in using these methods; and exploring the remittance channels and migrant workers’ preferences. Before joining MicroSave, Anurodh was a product manager at ICICI Bank’s Rural Micro-banking and Agri Business Division. He was responsible for: conducting market research to understand viable business opportunities; structuring credit policies; and rolling out the product and credit process for lending to small and medium agri enterprises. He holds a Masters in Business administration from the Institute of Chartered Financial Analysts of India.